When my daughter started competing, she danced against the same people over and over again, and we began to recognize the girls (and an occasional boy) from feis to feis and year to year, but had no idea what their names were. We started to ‘label’ the other dancers so we could identify them. None of them mean spirited, although I guess some may sound that way if you didn’t know the story behind them, they were just a way for us to be able to talk about things like ”nickname has really nice kicks” or “nickname got a new dress” or whatever, until we eventually learned the dancers real names. I have been wondering about this topic for a while, thinking that we (my daughter and I) could not be the only ones that had nicknames for other dancers, and when another dance Mom recently told me one of the nicknames her and her daughter had, I figured I would just write this and see if this was common, or if the dance Mom and I were the only ones. Amazon – Early on, the girl child would dance against this extremely tall girl, literally a foot or more taller than the other girls and she gained the nickname ‘Amazon’ from the tall female warriors of Greek mythology. We have since met her and her parents and she is one of the nicest young ladies, so she has lost the moniker, but that is where it started for us. Grumpy – there was this one girl who would NEVER smile on stage, but danced extremely well, besting the competition in most every event. It was almost like she danced because she was forced to, and she kept an Eeyore attitude throughout the competition. The fact she did so well but did not seem to enjoy any of it got her the nickname Grumpy. Rachel from Akron – I know, not much of a nickname but Rachel isn’t from Akron. That is where we first met her and her family, so in a way, its a nickname. Rootbeer – the dancers initials were AW so that one just kind of created itself. Rachel from Michigan – I know, another one that is not so creative, but since we already had Rachel from Akron, we needed a way to tell them apart. Rachel from MI is indeed from MI. Disco Ball – this is not so much about the dancer as it is her dress, which has SO many sequins, well, you get the idea. So what about you? Any nicknames or stories you would like to share? Take our poll or add comments below. Hello there! I just discovered your website (I was looking for the Dayton Feis stage assignments which are *still* not up, 2 days before feis time!) and one of the links which popped up on Google was yours. This is a brilliant idea, and I’ve really enjoyed reading your reviews (the North Coast Feis is misplaced, however – we’re not in Michigan). Keep up the good work! We’ve had a number of nicknames for various dancers over the years. There was one Burke dancer who seemed almost twice the height of our very petite daughter, so she became The Jolly Green Giant. We have a picture of the two of them standing next to each other at the Cleveland Feis on the stage as they waited to dance, which is just too funny. We have our own Grumpy (she has the kind of scowl when she dances that makes you believe she has murder on her mind). No Disco Ball, but we do have a Crystal, as it seems her dressmaker simply sprayed her dress with adhesive and then rolled it in a bin of Swarovskis *g*. In that vein we also have Cake (as in – “that dress takes the cake”, so fluorescent that it’s possibly the only dress that can be seen from low earth orbit. In the dark). My own daughter used to call herself the Iron Lass, because her red and gold costume made her think of Iron Man (and because she has a thing for Robert Downey, Jr.). Alas, that dress no longer fits, and her current pink, white and green doesn’t lend itself to any pithy shorthand that we can think of. 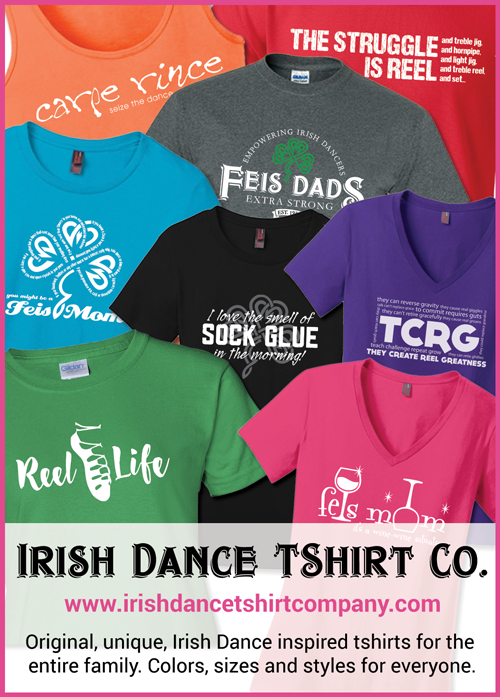 Anyway, I am glad I found your site, and I’ll add you to my list of Cool Irish Dance Related Web Sites we give out in our new parent informational materials! If you don’t already, you can also follow my antics on Twitter @whatthefeis and on Facebook. Use the follow us links below for easy access. Also, make sure I have your school listed on the schools list. See you in Dayton this weekend(maybe)! Just found your blog, have to agree about the Akron feis in 2011… We will be at Dayton for the first time this weekend. One nickname we have is “girl who always goes last,” she positions herself to dance last consistently. There is one I won’t share because we have since met the girl and she is really sweet (the nickname had to do with her wig). I was always Pumpkin or Flame due to my ginger hair.